Von Hertzen Brothers are a Finnish rock band who over the last decade have released four albums. The band consists of the three Von Hertzen brothers (Mikko, Kie & Jonne), all of whom had been in other bands before teaming up together. This new release, "The best of" is as the name suggests, a compilation of their best songs. The album includes songs from each of their four albums. This is a band I've not seen live - I'd hoped to see them when they played the High Voltage festival but due to a scheduling clash unfortunately missed them. Their music is really hard to categorise as its so diverse and a single song can have varying different influences present. I'd say they're probably best described as Prog, although that doesnt truly reflect their diversity, but it does give people an idea what to expect. Early Pink Floyd sounds to be a strong influence, but there are plenty of other heavier influences too. The vocals are clean and quite high pitched - the sort of thing you'd expect on an AOR album, and the music certainly has a prog feel, something the keyboards certainly contribute to, but there's enough guitar here to keep it firmly in the rock camp. Of all the albums I've reviewed, this is probably the hardest to describe accurately - I suggest you check their website or facebook page, or watch their videos on youtube to make your own mind up. I am glad that there are bands like this making such unique music - whether it appeals to you or not, we should all be glad that there are musicians who are happy to ignore genre boundaries and make the music that they want to make - it's in this spirit of originality that some of the best music appears. If you havent got any albums by Von Hertzen Brothers then this is definitely a good album to start with - it gives a taster of each album and is a very enjoyable album to listen to. As well as the CD there is a DVD in the package with videos for some of the songs, some live songs and some video blogs. It's this part of the album that adds value and makes it an attractive purchase for fans who already own the albums. 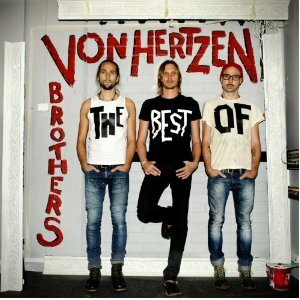 The Best of Von Hertzen Brothers is available now from Spinefarm records.